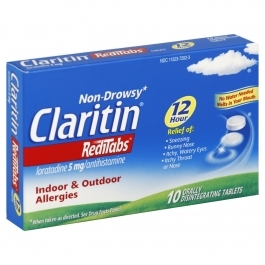 Claritin RediTabs provide powerful, 12 hour, non-drowsy relief of your worst indoor and outdoor allergy symptoms, including sneezing, runny nose, itchy/watery eyes, itchy throat/nose. Claritin provides relief of symptoms that can be triggered by over 200 different allergens. Claritin is an antihistamine, so it hinders the cascade triggered by allergens. Easy-to-take, orally dissolvable tablet, melts in mouth and requires no water. For adults and children ages 6+. One tablet contains 5mg of loratadine. Active Ingredient (In Each Tablet): Loratadine 5 Mg, Purpose Antihistamine. Inactive Ingredients: Anhydrous Citric Acid, Gelatin, Mannitol, Mint Flavor. Do Not Use If You Have Ever Had An Allergic Reaction To This Product Or Any Of Its Ingredients. Ask A Doctor Before Use If You Have Liver Or Kidney Disease. Your Doctor Should Determine If You Need A Different Dose. When Using This Product, Do Not Take More Than Directed. Taking More Than Directed May Cause Drowsiness. Stop Use And Ask A Doctor If An Allergic Reaction To This Product Occurs. Seek Medical Help Right Away. If Pregnant Or Breast-Feeding, Ask A Health Professional Before Use. Keep Out Of Reach Of Children. In Case Of Overdose, Get Medical Help Or Contact A Poison Control Center Right Away. Do Not Use If You Have Ever Had An Allergic Reaction To This Product Or Any Of Its Ingredients. Ask A Doctor Before Use If You Have Liver Or Kidney Disease. Your Doctor Should Determine If You Need A Different Dose. When Using This Product, Do Not Take More Than Directed. Taking More Than Directed May Cause Drowsiness. Stop Use And Ask A Doctor If An Allergic Reaction To This Product Occurs. Seek Medical Help Right Away. If Pregnant Or Breast-Feeding, Ask A Health Professional Before Use. Keep Out Of Reach Of Children. In Case Of Overdose, Get Medical Help Or Contact A Poison Control Center Right Away.